Goalrilla is a serious in-ground basketball hoop brand made for serious basketball players. These in-ground hoops are made with top of the line materials and demand a high price. Goalrilla’s newest in-ground basketball system, the Goalrilla FT, continues this strong reputation and adds some new features to set the FT apart from some of the past models from Goalrilla. All Goalrilla basketball systems feature tempered glass backboards, and the Goalrilla FT is no different. What is nice about the FT is that it comes in three different backboard size options: 54 inch, 60 inch, and 72 inches. Which backboard size to select will depend on your specific needs. For those looking for a hoop to fit in a smaller space, we’d recommend the 54 inch backboard version. While smaller, the 54 inch backboard still performs very well and still allows you to practice bank shots. The 60 and 72 inch versions are best for hoopers that have large spaces and home courts available. For the vast majority of players, you won’t require more than a 60 inch backboard. Only those who require a regulation size backboard on their hoop should opt for the largest backboard option. The Goalrilla FT features a professional quality breakaway rim. This rim has a heavy-duty spring that is protected by a steel cover for enhanced safety and protection. You can expect the this rim to have gym quality feel and performance. To top it off this rim is able to handle dunking, which is something you will likely be doing since the hoop can be lowered to 7.5 feet. At that height we can all pretend to be our favorite NBA star. In my humble opinion, support poles are the most underrated piece of equipment when it comes to recreational basketball hoop quality. Cheap three piece support poles allow for too much vibration during play and don’t stand up to the test of time. Thankfully, for those looking to pick up the Goalrilla Ft, you are in luck. The Goalrilla FT comes with a one-piece square steel support pole that is powder coated to protect from rusting. 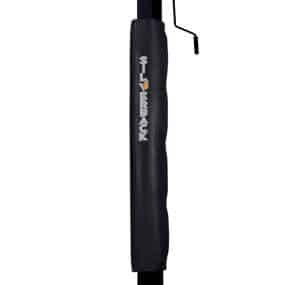 One-piece support poles are the best support poles available and are found only on the best in-ground basketball hoops. With the support pole system comes a bolt anchor system that bolts your hoop to the concrete foundation. This anchor system comes in handy if you ever need to move your hoop as it makes an in-ground basketball system transportable. Simply unscrew the bolts, load up the hoop, and go. Attaching the support pole to the backboard are two wide angle steel arms. 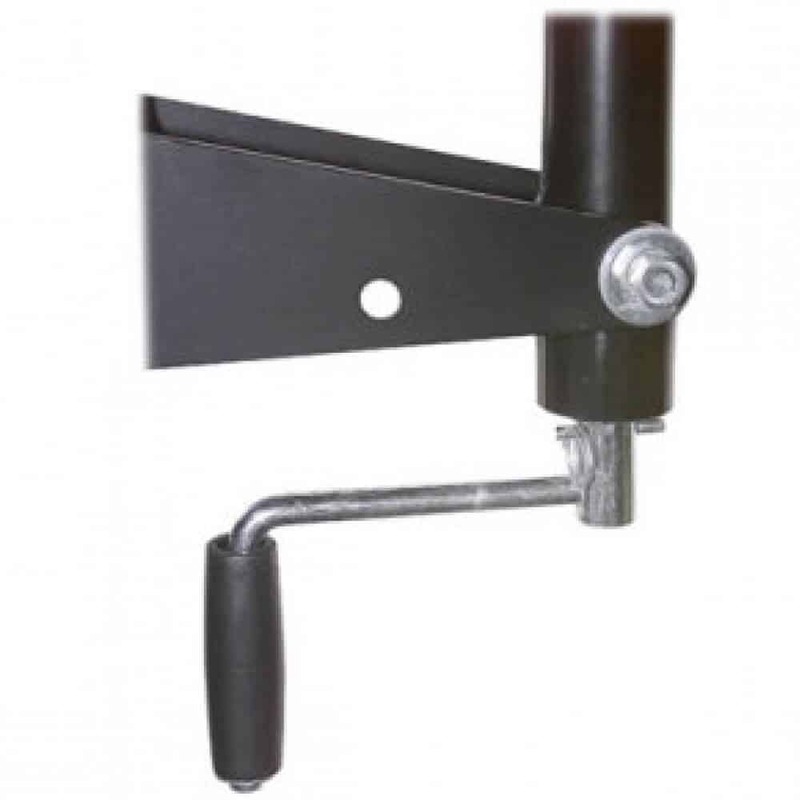 These two arms attach at the horizontal edges of the backboard creating even greater stability than systems that use a more narrow attachment arm design. 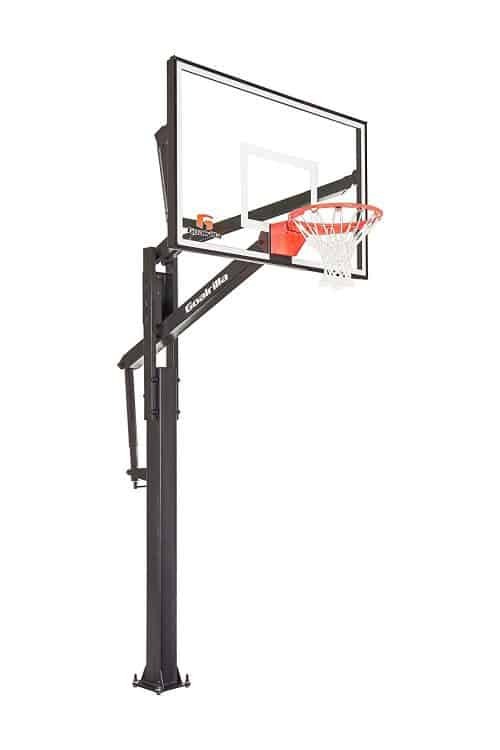 As with most recreational basketball systems, the Goalrilla FT’s height can be adjusted from 7.5 to 10 feet. This basketball hoop uses a crank system to adjust the height. Crank height adjustment systems allow you to adjust a system’s height in infinite increments allowing it to meet your specific needs. 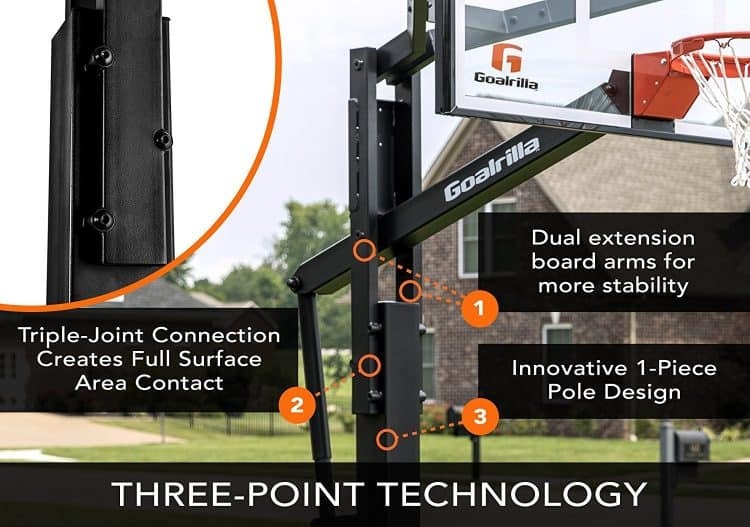 Goalrilla has done it again with the FT in-ground basketball system. 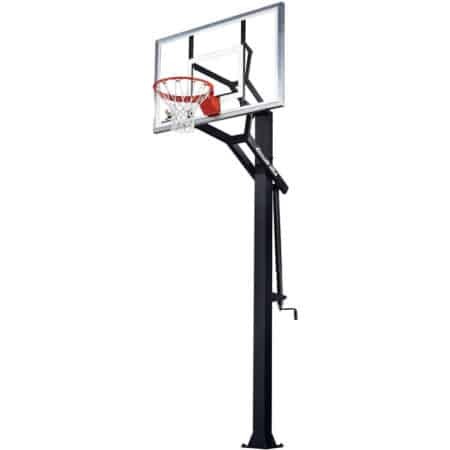 The variety of the backboard sizes coupled with the quality of system makes this one of the best in-ground basketball systems that money can buy. For those who are set on having backboard and support pole padding, you can purchase this separately. Similar hoops to the Goalrilla FT include the Goalsetter All-American and the Lifetime Mammoth In-Ground Basketball System. 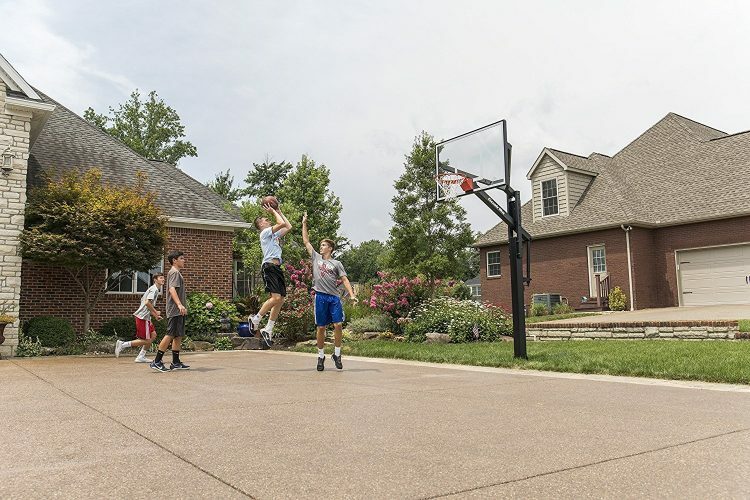 the most compact offering from Goalrilla that will accommodate smaller driveways and courts while retaining the quality that a Goalrilla hoop provides. The Goalrilla GLR GS 54 is one of the most affordable offerings from Goalrilla. 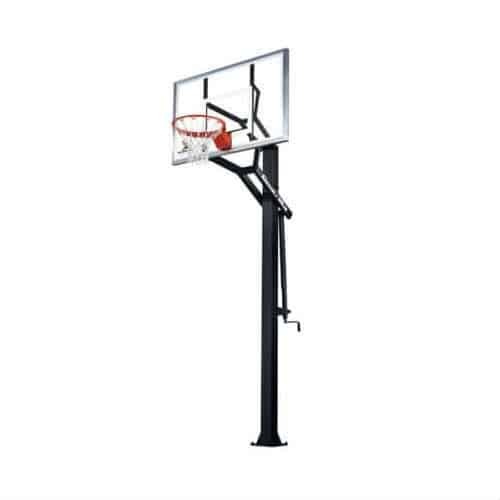 For those who want a larger Goalrilla hoop we recommend you take a look at the Goalrilla GLR GS-1 hoop that offers a full size 72 inch backboard. basketball hoop stability and enhances the performance of this system. The support pole measures at 5 inches by 5 inches giving a heavy duty feel to this hoop. Also, you will not have to worry about this system’s support pole rusting out for many years as it is powder coated to last. While the 2 and a half foot offset from support pole to hoop is not as large as other high end hoops, simply buying a support pole pad will minimize the risk of injury for any players driving to the hole. 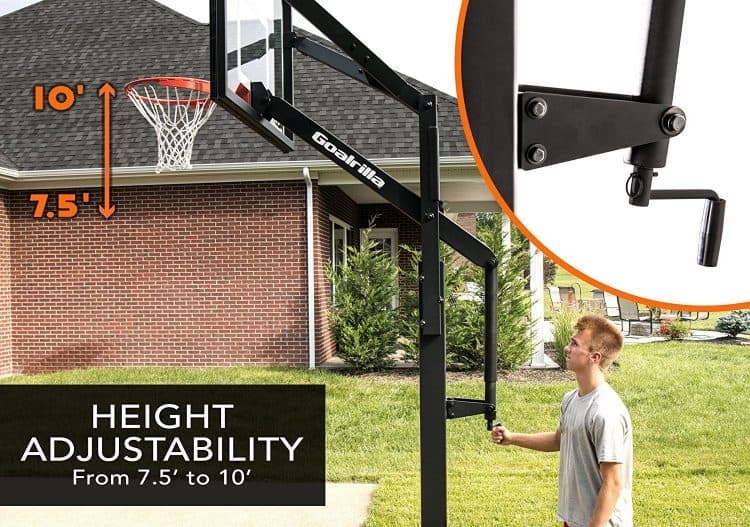 The crank adjustment system on this hoop allows you to adjust the height from 7 feet to 10 feet in infinite increments. This allows for more dunking opportunities as well as assists youngsters in gaining proper shooting form. 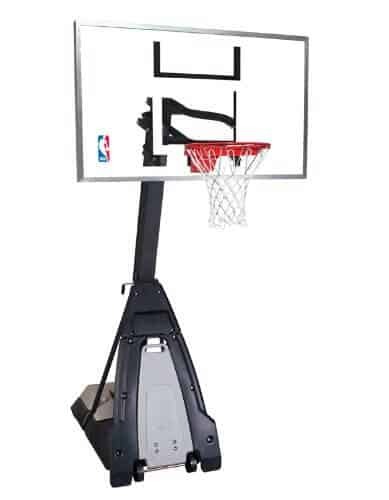 To wrap things ups, you simply will not find a better 54 inch backboard basketball system than the Goalrilla GLR GS 54. This hoop is a higher price range than similarly sized options, but in this case you get what you pay for. We highly recommend that if you buy this hoop to go ahead and get the padding for the support pole for extra protection. 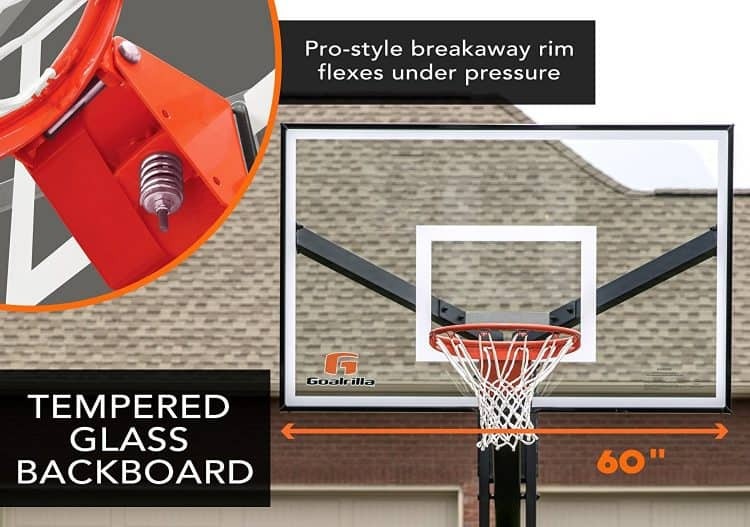 If you are looking for a larger top quality hoop we suggest that you consider the Goalrilla GLR GS-I or the Spalding Arena View Basketball Hoop.